Reading, writing and earthquake forecasting. Suganth Kannan presents his research on earthquakes at the International Conference on Engineering Failure in The Hague. Though the International Conference on Engineering Failure Analysis is packed with ideas that could grow into dozens of fiery disaster movies, it's not what you would call a kid-friendly zone. The scientific presentations covered, in part, bridge and office-tower collapses, plane and train crashes. The focus, however, is on why these catastrophes occur, not the slow-motion tumble of metal girders. 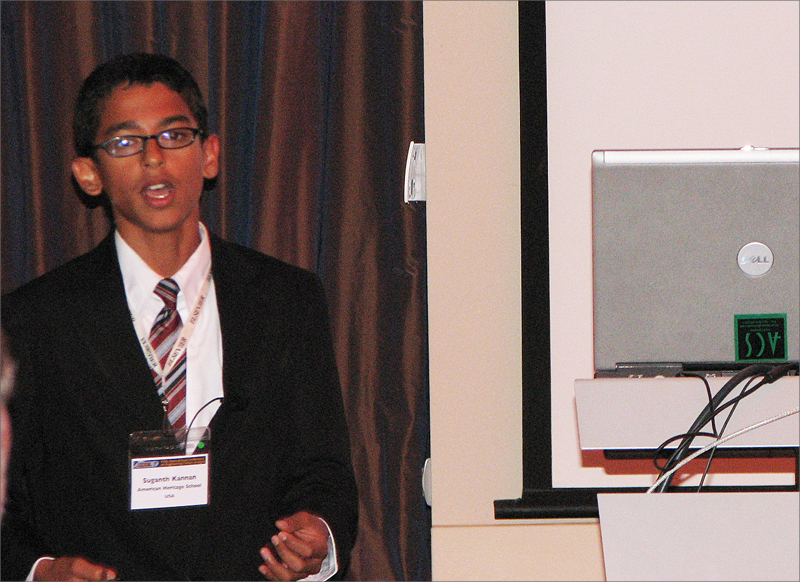 Nevertheless, into the lobby of this Elsevier conference strolled 12-year-old Suganth Kannan with his parents in July. There he planned to present a mathematical model for earthquakes, which he hopes could lead to more accurate and timely earthquake prediction saving lives and potentially billions of dollars. "We had no idea that he was just 12 years old," said Laney Zhou, the Oxford-based Executive Publisher at Elsevier, which organized the conference in publishes the supporting journal, Engineering Failure Analysis and five others in the field of solid mechanics. "Usually our presenters are professors, engineers with PhDs, or at least PhD students," she said. As for Suganth, he had just completed the seventh grade at the American Heritage School in Plantation, Florida. He lives in the nearby town of Weston. Even though he lacked the typical academic credentials for the peer-reviewed conference, Suganth has accomplished a lot in his young life. He's a chess champion in Florida and a member of his school swim team. He plays violin in the school orchestra and performs classical Indian music with a state choir. And last year, he conducted extensive research into bed bugs, sharing in a first-place finish at the 2011 Broward County Middle School Science Fair. As a result, later that year he organized and moderated a symposium on bed-bug research at the Florida Entomological Society annual meeting. For his quake study, Suganth gathered and analyzed massive amounts of data from the National Earthquake Center of the US Geological Survey. He did this for his school science fair under the mentorship of Dr. Charles Golden, head of the advanced science research program and Professor of Psychology and director of the neuropsychology program at Nova Southeastern University in Fort Lauderdale, Florida. Dr. Golden is also an active researcher whose publications include more than 400 journal articles and books. In Suganth's words, Dr. Golden is the "best science mind I have come across in my life" and a "wonderful motivator of me for the past 4 years." Likewise, Dr. Golden was positive in his assessment of Suganth, calling him "incredibly bright." "He has intelligence and thoughts and insights characteristic of an adult, but his emotional development is that of an eighth-grader, which is an interesting combination," he said. "He's a very hard worker, and he comes from a family of very intelligent and very accomplished people." Suganth's study reports a mathematical relationship among the timing, location and intensity of earthquakes in a fault zone and the location of the next likely rupture. When applied to the historic data, Suganth said his model was able to retroactively predict earthquakes up to 200 days in advance with an accuracy rate of 65 to 70 percent. 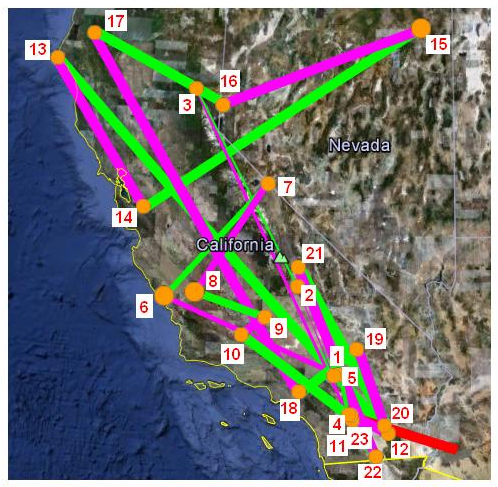 California Earthquakes (2001-2011) Spacial Connections. The size, distances and timing of California earthquakes were compared in this graphic by Suganth Kannan. Quakes are represented by tan circles. Their relative power is represented by circle size. While that accuracy rate is too low and the timing too imprecise to serve as an early-warning tool for emergency officials to evacuate at-risk communities, Suganth said it could be useful when used in conjunction with other quake-forecasting methods. By using his model to identify high-risk locations, Suganth said, these areas then could be flooded with ground-motion sensing devices which pick up subtle changes that often signal an earthquake is imminent. "I feel that a combination of the two would be able to solve the puzzle of earthquake prediction," Suganth said. Though Suganth is waiting to learn if his research will win publication in Elsevier's Engineering Failure Analysis, and is planning further work in quake prediction, he's already plotting his next research project. And just as he previously jumped from entomology to mathematical modeling of earthquakes, Suganth is looking to explore a new scientific field. "I love all branches of science," he said. Whatever science Suganth chooses, those around him have high expectations. "He's really just at the beginning of his career," Dr. Golden said, "and we are looking forward to him going much farther." Catastrophic earthquakes produce major economic consequences with damage to ports, highways, railroads, bridges, buildings, communication systems, etc., causing loss of human life and hardship to public. There is an urgent need to predict future earthquake occurrences to help save precious lives and reduce economic consequences. The hypothesis was if an Innovative Mathematical Model (IMM) analysis is carried out on the past ten to twenty years of earthquake data with Latitude, Longitude and Magnitude as Variables using Mathematical principle of Poisson's distribution and Spatial Connections for a large data group for each earthquake zone, then there will be an identifiable pattern within the random occurrences of the earthquakes around each fault zone. Using fault lines and past earthquake data from United States Geological Survey (USGS) National Earthquake Information Center (NEIC) the following six different zones were identified for analysis: California, Central USA, North East, Hawaii, Turkey, and Japan. Creating Innovative Mathematical Model (IMM) with Spatial Connection and Poisson's distribution of the past data, predictions for future earthquakes were found for six different earthquake zones around the world. Using the results of this research, Disaster management agencies like United Nations (UN), Federal Emergency Management Agency (FEMA), U.S. Agency for International Aid (USAID), Turkey's Emergency Management General Directorate (TEMGD), and Fire and Disaster Management Agency, Japan (FDMA) can allocate and position their resources in the right location to assist people in evacuation, supply and save lives. Len Maniace is an Executive Editor for Global Internal Communications at Elsevier. He worked 32 years as a journalist, mostly with Gannett in New York (The Journal News), reporting on science, medical, environmental, health-policy and government news, as well as serving as assistant city editor. He later covered breaking news in New York City for the New York Post. Outside of work, he leads an environmental sustainability program for a volunteer, nonprofit group in his New York City neighborhood of Jackson Heights, Queens. He is married and has two sons. Laney Zhou, Executive Publisher at Elsevier, and Alison Bert, Editor-in-Chief of Elsevier Connect, also contributed to his report. Now let's the question everyone is waiting for: when and where will the next earthquake take place? Earthquakes are continuously happening in each of these fault zones. It has to be looked in to by each fault zone. I am working on refining my research idea further to provide general public an interface where they can find the risk for the locality they live in. It takes time to get my thought in to workable solution, but i am determined to do it before end of this school year. Thanks. good work done Suganth. get in contact with the people already researching in the field. you will soon get the breakthrough, all the best. Thank you for your encouragement. Of late, I am planning to do that. If a minuscule improvement in forecasting could be achieved, that would help further the field of earthquake forecasting. Thanks.